(CNSNews.com) – The proportion of Christians to Muslims among refugees from around the world admitted to the United States has changed significantly in FY 2018, with Christians comprising seven in ten new arrivals, and Muslims fewer than two in ten. With ten days of the fiscal year to go, a total of 21,561 refugees have been resettled since October 1 last year, of whom 15,278 (70.8 percent) are Christians and 3,333 (15.4 percent) are Muslims, according to State Department Refugee Processing Center data. 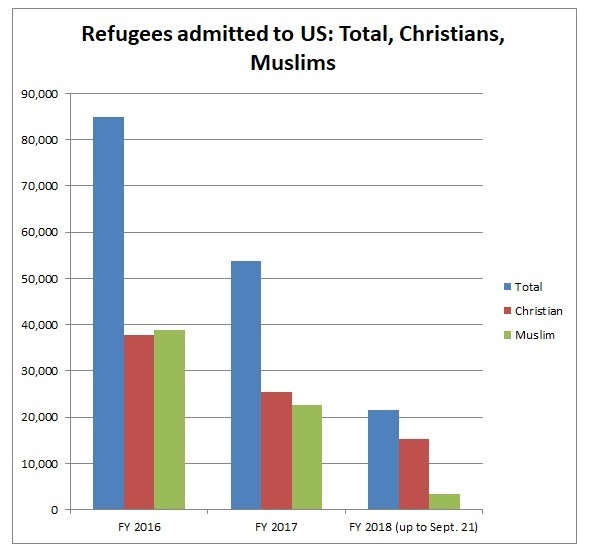 In FY 2017 by contrast, 47.2 percent of the 53,716 refugees admitted to the U.S. by both the Obama administration (during roughly the first one-third of the year) and the Trump administrations (during roughly the remaining two-thirds of the year) were Christians, and 42.1 percent were Muslims. And in FY 2016, 44.5 percent of the 84,994 refugees resettled in the U.S. by the Obama administration were Christians and 45.7 percent were Muslims. That was the first time in a decade that the total refugee intake from around the world included more Muslims than Christians. Apart from Christians and Muslims, the denominational breakdown for FY 2018 includes Buddhists (5.2 percent), Hindus (3.1 percent) and Jews (0.5 percent), mostly from Bhutan, Bhutan again, and Russia respectively. The Christian refugees include large contingents of Catholics, Protestants and Pentecostalists from the Democratic Republic of Congo – which alone accounts for almost 39 percent of the total number of refugees resettled in the U.S. There are also sizeable numbers of Baptists from Ukraine, Orthodox Christians from Eritrea, and Christians (no denomination specified) from Burma. Muslim refugees comprise 2,016 individuals identified simply as Muslim, with Burma (857) and the DRC (324) accounting for the largest groups; 655 Shi’ites, including 504 from Afghanistan; and 486 Sunnis, with Afghans again making up the largest number (226). The U.S. has also admitted 173 Ahmadiyya – all from Pakistan, a country whose constitution does not recognize Ahmadis as Muslims, and whose penal code criminalizes Ahmadi worship. In recent years the makeup of Syrian refugees in particular became a sensitive issue, both because of overall security concerns but also because so few of those admitted were Christians. That was the case despite the Obama administration’s determination in 2016 that ISIS’ atrocities against Christians, Yazidis and other religious minorities in areas under its control amounted to genocide. The disparity was especially stark in FY 2016, when of a total of 12,587 Syrian refugees admitted – accounting for 1.8 percent of all refugees admitted that year – 12,486 (99.2 percent) were Muslims and 68 (0.5 percent) were Christians, including Orthodox, Greek Orthodox and Catholic. 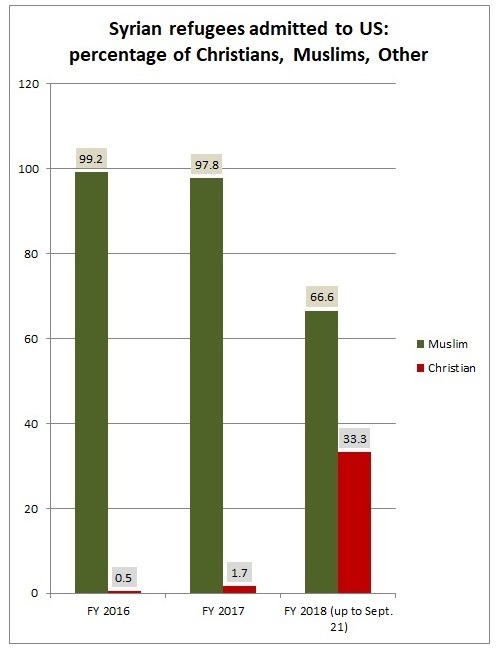 Although Muslims do significantly outnumber Christians in Syria, the Christian minority nonetheless made up around 10 percent of the total population when the civil war began in 2011. In FY 2017, the U.S. resettled 6,549 Syrian refugees, or 12.2 percent of all refugees admitted that year. Of those Syrians, 6,405 (97.8 percent) were Muslims and 113 (1.7 percent) were Christians. In FY 2018, however, of 60 Syrian refugees admitted – just 0.27 percent of all refugees admitted this year – 40 (66.6 percent) are Sunni Muslims and 20 (33.3 percent) are Christians. President Trump came into office vowing to prioritize Christian refugees. 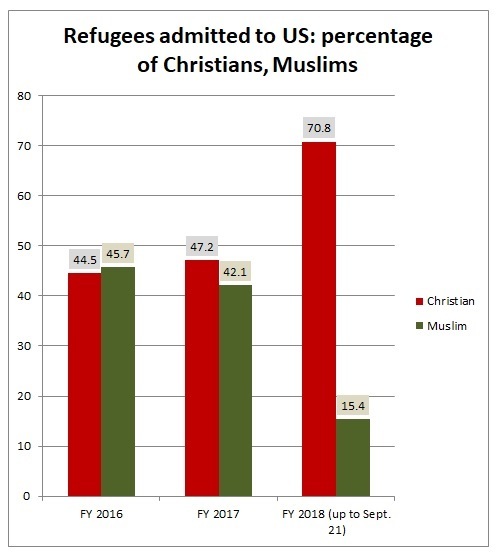 Although his policies have seen a sharp drop in the overall number of refugees admitted to the U.S., the shift in the Christian-Muslim ratio has been marked. Overall, FY 2018 has seen the smallest number of refugees admitted to the U.S. (21,561 as of Thursday) in any one year since 1977 (when 19,946 were resettled). Three years later, the Refugee Act put the current refugee resettlement program in place. Since 1980, the lowest number of refugees admitted until now was 27,131, in FY 2002. The Trump administration this week proposed a refugee admission cap of 30,000 for FY 2019, the lowest since the legislation was enacted in 1980. It will now consult with Congress before a final determination by the president.